Jasper Tudor was the uncle of King Henry VII and played an important role in aiding Henry VII’s accession to the throne and the founding of the Tudor dynasty. Jasper was born in 1431 the second or third son of Henry V’s widow, Catherine of Valois and Owen Tudor, the keeper of her wardrobe. Both he and his brother Edmund were half-brothers to King Henry VI. Jasper’s parents had secretly married around 1429 but had kept the marriage secret because Owen was a Welshman and a commoner. Jasper’s mother should have asked the King’s permission to marry since she was Dowager Queen. Furthermore, it was illegal for marriages to be made between the English and the Welsh. Jasper’s mother died when he was six years old, shortly after giving birth to a daughter at Bermondsey Abbey. Shortly afterwards, Jasper’s father, Owen was arrested and imprisoned. 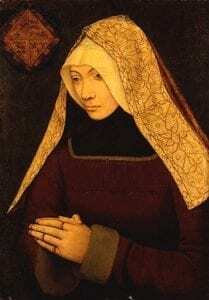 Jasper and his older brother, Edmund, were then sent to live with Katherine de la Pole, abbess of Barking. In 1442 Henry VI began to take an interest in his half-brothers and took charge of their upbringing. He created Edmund Earl of Richmond in 1449 and on 23rd November 1452 Jasper was created Earl of Pembroke and given Pembroke Castle. Jasper and Edmund were knighted at the Tower of London on 5th January 1453. In 1453 Jasper and Edmund were jointly given the wardship of Margaret Beaufort only child of John Beaufort, heiress to the Beaufort fortune. Two years later, Jasper’s brother, Edmund married 12 year old Margaret and she became pregnant the following year. In late Summer 1453, Henry VI suffered a bout of mental instability which left him unable to rule the country. Henry’s chief adviser, the Duke of Somerset, took charge of government but he ruled badly and Henry’s heir, Richard Duke of York, believed that he should take control. In Spring 1454 both Jasper and his brother Edmund backed Richard of York’s request to be proclaimed Protector of England. When Henry recovered his mental faculty and re-appointed the Duke of Somerset, Richard of York raised a force against Henry. Jasper and Edmund had to choose which side to support. 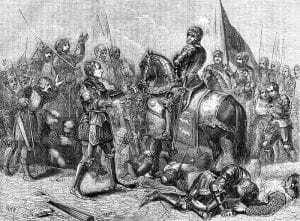 Jasper fought in the first battle of the Wars of the Roses, the First Battle of St Albans, for Henry VI on the Lancastrian side. The Lancastrians lost the battle and Henry VI was captured but Jasper and Edmund declared their support for Henry VI and remained on the Lancastrian side. Richard Duke of York captured Jasper’s brother Edmund in November 1456 and he died while in prison. Jasper took in his brother’s pregnant widow, Margaret Beaufort and her son, Henry, was born at Pembroke Castle on 28th January 1457. For his continued loyalty to Henry VI, Jasper was made constable of a number of castles in Wales, including Aberystwyth and Carmarthen. He was made a Knight of the Garter in 1459. 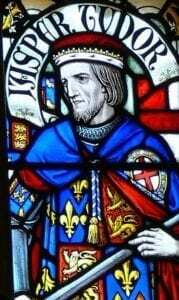 In 1461 Jasper and his father, Owen Tudor, led a Welsh force against Edward Duke of York at the Battle of Mortimer’s Cross. They lost the battle and although Jasper escaped, his father was captured and executed. When Edward took the throne as King Edward IV, he declared Jasper a traitor. Jasper’s lands and titles were forfeited and Edward wanted him captured. Jasper fled to Ireland and then to Scotland before going to Brittany in 1462. There he joined forces with Margaret of Anjou and together they petitioned Louis XI of France for support. In the Autumn of 1462 Jasper invaded the north of England at the head of an invasion force. He managed to capture Bamburgh Castle but was unable to progress south. By December he realised his situation was hopeless and surrendered in exchange for safe passage to Scotland. Jasper then spent the next few years travelling between Scotland and Brittany trying to raise support for Henry VI’s son, Edward, to mount an invasion and remove Edward IV. In 1468 Jasper returned to Wales to relieve Harlech Castle. Jasper returned to the continent after being defeated by William Herbert. Edward IV rewarded Herbert by creating him Earl of Pembroke and giving him Pembroke Castle. Herbert was also given custody of Jasper’s nephew, Henry Tudor. In the Autumn of 1470 Jasper was part of an invasionary force that included Henry VI’s son, Edward, Edward IV’s brother, George Duke of Clarence and Richard Neville, Earl of Warwick. Rather than fight, Edward IV fled to Burgundy where he raised support. Henry VI returned as King, Jasper was restored as Earl of Pembroke and given back Pembroke Castle. Jasper took Henry Tudor to court and presented him to Henry VI. In 1471 Edward IV returned and after winning the Battle of Tewekesbury, regained the throne on 22nd May 1471. Henry VI was captured and probably murdered on the same day. Henry VI’s son, Edward, had died during the battle and so Henry Tudor became the sole remaining Lancastrian heir to the throne. Shortly after re-taking the throne Edward IV instructed Roger Vaughan to capture Jasper and Henry Tudor. However, Jasper captured Vaughan and executed him before fleeing to Brittany taking Henry Tudor with him. In late 1471 Edward IV unsuccessfully petitioned Duke Francis II of Brittany for the extradition of Jasper and Henry Tudor. Undeterred Edward sent spies to Brittany to seek them out. In 1474 Jasper and Henry Tudor agreed to separate in order to make it harder for them to be found by Edward’s spies. They both lived separately on the continent for the next eight years. 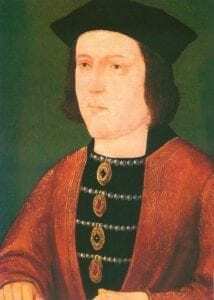 In April 1483 Edward IV died and his son became King Edward V. In June, Edward IV’s brother, Richard Duke of Gloucester, declared that Edward’s marriage to Elizabeth Woodville was invalid and as such their children were illegitimate. Edward V and his younger brother were placed in the Tower of London and Richard took the throne as Richard III. The Duke of Buckingham rose in rebellion against Richard III in October 1483 and Jasper and Henry Tudor attempted to cross the Channel to support the rebellion. Due to unfavourable weather their ships were blown off course. The rebellion was suppressed and Buckingham was executed as a traitor. Back in France, Jasper and Henry raised finances and troops for an invasion and on 7th August 1485 they landed at Milford Haven in Wales. After raising support they met the forces of Richard III at the Battle of Bosworth Field on 22nd August 1485. Richard was killed during the battle and Henry Tudor was proclaimed King Henry VII. King Henry VII restored Jasper to the Earldom of Pembroke and gave him back Pembroke Castle. Henry showed his gratitude to Jasper by giving him the honour of carrying the crown during Henry’s coronation. Henry kept Jasper close at hand as an adviser, particularly in military matters. Later, Henry created him Duke of Bedford, a title previously held by the brother of King Henry V.
In 1486, Jasper was made military commander of a force that suppressed revolts by Lovell and Stafford. Later that year he was created Lord Lieutenant of Ireland and in 1487 he took part in the Battle of Stoke that saw the forces of the pretender, Lambert Simnel, defeated. Jasper married Catherine Woodville, widow of the Duke of Buckingham, sister of Edward IV’s queen, Elizabeth Woodville in November 1485. In 1492, at the age of 61 years, Jasper saw his last military action fighting against the French. He died on 21st December 1495 at Thornbury.